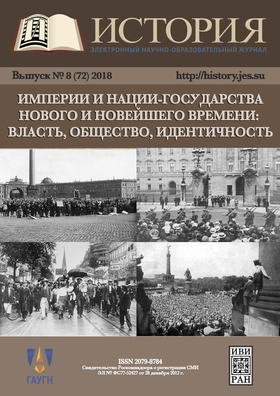 The articles of this issue focuses on the fact that in determining the formats of state-building and political organization of societies by modern historical science, not only national vectors should be taken into account, but also the diversity of imperial practices. The processes of state and nation building in the Imperial and post-Imperial dimension are analyzed on a broad historical material. It is concluded that the formation of empires led to the strengthening of the national at the expense of the colonial and to their active rapprochement — colonizers and colonized in each historical situation by their goals, actions and inaction mutually determined the nature and dynamics of the relevant processes, re-perceived and identified themselves and the “other”, while building social boundaries, highlighting cultural differences. Identity in the contemporary world is conceptually related to what is called the cultural frontier, when mental and cultural identity is not indifferent to the presence and ambiguity of the Other. A nation, a national culture cannot remain alone with its identity, so that distinguishes it from other nations, cultures. Identity requires communicative space and correlation with other socio-cultural fields.